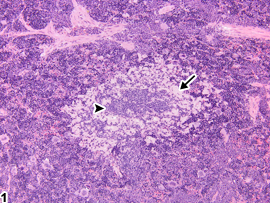 Spleen - Amyloid in a male B6C3F1/N mouse from a chronic study. Amyloid protein (arrow) surrounds and infiltrates the white pulp, which is atrophied (arrowhead). Spleen - Amyloid in a male B6C3F1/N mouse from a chronic study (higher magnification of Figure 1). Amyloid protein is present within the marginal zone and red pulp (arrows). Amyloidosis is a systemic disease characterized by the extracellular deposition of amorphous proteinaceous material in multiple tissues, including spleen, liver, and kidney. In the spleen of mice, amyloid is deposited in the red pulp and adjacent to the white pulp (marginal zone) ( Figure 1 and Figure 2 , arrows). When this lesion is severe, it can result in white pulp atrophy ( Figure 1 , arrowhead). Amyloid can be identified by apple-green birefringence when stained with Congo red and visualized under polarized light, or it can be detected immunohistochemically. Amyloidosis is rare in B6C3F1 mice and rats. The incidence of spontaneous amyloidosis in mice increases with age and may be influenced by various factors, including breeding origin, diet, environment, and inflammation. In mice, spontaneous age-associated (senile) amyloidosis has been associated with amyloid apolipoprotein A2 (ApoA2) deposition, whereas inflammatory-induced amyloidosis has been correlated with serum amyloid A (an acute-phase protein). ApoA2 is a major constituent of serum high-density lipoprotein in mice. Whenever present, amyloid in the spleen should be diagnosed and assigned a severity grade. Since amyloidosis is a systemic disease, other tissues, such as liver and kidney, should also be evaluated for amyloid. 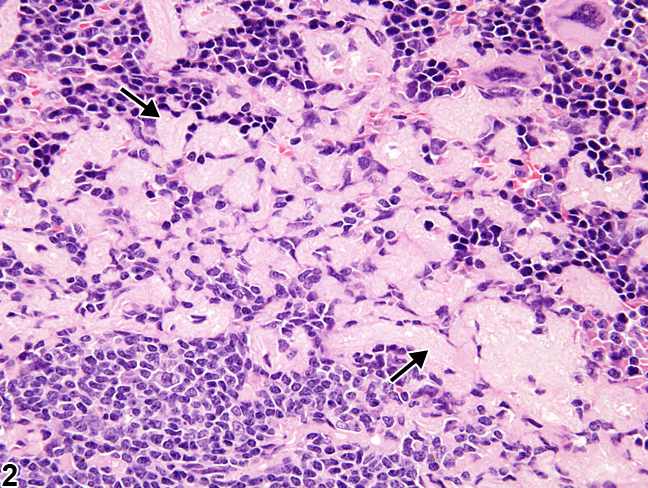 Secondary lesions, such as necrosis or degeneration of parenchymal cells, should not be diagnosed separately unless warranted by severity or important for interpretation of study results, but should be described in the pathology narrative. Ge F, Yao J, Fu X, Guo Z, Yan J, Zhang B, Zhang H, Tomozawa H, Miyazaki J, Sawashita J, Mori M, Higuchi K. 2007. Amyloidosis in transgenic mice expressing murine amyloidogenic apolipoprotein A-II (Apoa2c). Lab Invest 87:633-643. Harada T, Enomoto A, Boorman GA, Maronpot RR. 1999. Liver and gallbladder. 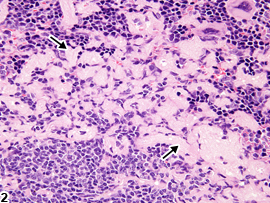 In: Pathology of the Mouse (Maronpot RR, ed). Cache River Press, Vienna, IL, 119-183. National Toxicology Program. 2010. NTP TR-558. Toxicology and Carcinogenesis Studies of 3,3′,4,4′-Tetrachloroazobenzene (TCAB) [CAS No. 14047-09-7] in Harlan Sprague-Dawley Rats and B6C3F1 Mice (Gavage Studies). NTP, Research Triangle Park, NC.